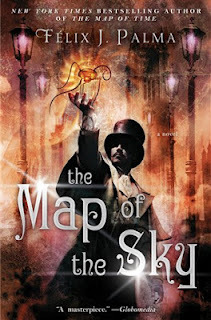 One of the books that I finished last year but didn't have time to review was The Map of the Sky by Félix J. Palma, sequel to 2011's The Map of Time. I was a bit conflicted in my thoughts about that first book but many of my issues (the chief of which was the first person narrative style) were solved in this one and, though not perfect, was a much more enjoyable read. As with the first novel, I don't want to say too much about the plot of this story. It's a tangled mess that slowly unravels into a story that's incredibly inventive and part of the joy of it is the element of surprise. I don't think it would be necessary to read these books in order but many things would make more sense and have more meaning if you were to follow the order in which they were written. Then again, there is a secret kept throughout this book that is basically one of the plots of the original story so if you were reading this one first, you would likely be shocked when you went back to the first novel. Confused yet? Well, with an ocean trip to the Antarctic, an alien invasion, an appearance by a young Edgar Allan Poe and another bizarre adventure for H.G. Wells, this story will likely confuse you and excite you in similar proportion. 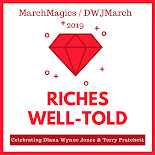 According to Palma's website (and if my Spanish isn't too rusty), the third book in the trilogy is currently being written and will focus on Wells' The Invisible Man (The Map of Time is built off of The Time Machine and The Map of the Sky uses The War of the Worlds as its inspiration). I'm definitely looking forward to Palma's final Victorian flight of fancy. That is a cool cover! I'm very intrigued; a steampunk-looking fantasy (gorgeous cover, btw) with HG Wells as a main character? Going to look for these right now! I want to read these books for the covers alone! They are gorgeous! I remember you telling me about the first book, and at the time I thought I'd like it, but I was a bit put off by its length. Since it's still on my shelf, I should probably give it a go, eh? Thanks for sharing your thoughts on this second in the trilogy! You had me at Poe! =) Will have to look for this series! Poe is only in the beginning of the story but it's a really different version of him than I've seen written before. He's the sane one!